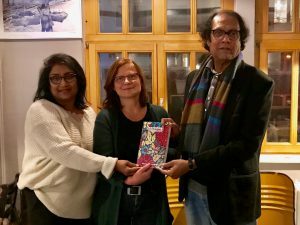 Sisir Dutta, the director of the Bangladeh Insititute of Theatre Arts (BITA), was invited to different project meetings and conferences in Greece and Germany in November 2018. During his stay in Germany, he has participated in an event of the Initiative für Internationalen Kulturaustausch IIK e.V. The dramatic situation of the Rohingya in Bangladesh and Myanmar was the subject of an information evening on 21 November. The speakers Hanno Schedler (Gesellschaft für bedrohte Völker – Society for Endangered Peoples), Sharaf Ahmed (photographer and journalist) as well as Sisir Dutta (Bangladesh Institute of Theatre Arts) reported on the massively discriminated against ethnic group which fled in large parts of Myanmar to neighbouring Bangladesh. Sisir used the opportunity to take several copies of the Learn2Change book for his work in Bangladesh.